Lloie's Cardigan has it in for me. I spent two days getting the yoke pattern established. The first go was off by one stitch but I didn't recognize the problem until I knit on it for a day. Then I ripped it all out and got it set up again. But my original yarns for the yoke did not have nearly enough contrast so I went stash-diving and came up with a skein of yarn labeled Felted Tweed in a great green. It has amazing contrast. The only problem is it isn't Felted Tweed. When I realized it I couldn't believe I thought for a moment it was. I believe it's long-discontinued Rowanspun DK. It's a single and Felted Tweed it plied. How didn't I noticed this? I think I was too focused on getting the color and pattern right. 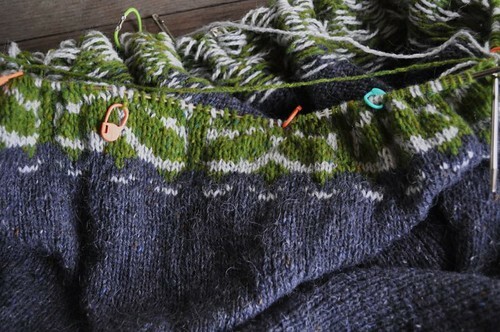 Anyway, I don't have enough of it to finish the sweater. I'm going to try to find something that will work. I really wanted to bring this finished sweater to camp and I leave in three days!